As an entrepreneur, you are always selling…prospects, customers, employees, investors, partners, market influencers. Always!!! But selling a new concept is tough enough and often the technology is complex enough to understand. A great CEO will simplify this complexity as opposed to “complexify” simplicity. But many of us get too cute and make our message overly complex. This confuses the market. They nod their heads politely but have no clue what you are trying to communicate. This is not good for your business. Simplify the message. One of the main challenges with entrepreneurial success is the entrepreneurs do not understand the power of simplicity (with clarity). In trying to sell to markets, and particularly when trying to sell to the early majority market (as opposed to early enthusiasts), entrepreneurs tend to use concepts and jargon that are simply not understood by their intended audience. They either use technology terms and concepts or marketing gobbledygook that the average buyer does not understand. Plus, they tend to focus on the product features other than the customer problems and uses of the product. Another issue is falling into the trap of telling someone everything you know as opposed to specifically what they need in order to become your customer. This may appear to make you look smart. But it does not help your cause. You may also think that providing all of this knowledge and detail will help you communicate better. It does not. There is an old saying “I asked him/her what time it was and they told me how to build a watch.” Same idea. What if your doctor said to you: “Strict adherence to a comprehensive medicinal regimen is essential to a maximum efficaciousness while maintaining vigilance towards unforeseen negative manifestations.” Huh? In other words: “Take your medications as prescribed and let me know of any side effects.” Simplify complexity. Look at another example. Ever notice all the commands and tools at the top of Excel? Do you ever use them? No? You probably key in numbers into rows and columns, use some basic formatting and auto-sum and that is pretty much it, right? Does Microsoft promote all of the functionality of Excel? No, it’s a spreadsheet. Simplify complexity. Clear: Is your message clear so it can be easily understood by anyone? Concise: Is it short enough so you don’t lose the attention of the buyer? Compelling: Is the message strong enough to make a potential buyer actually make a change? Consistent: Are we keeping the message the same or does it constantly change? But be careful. Over simplification is also dangerous. 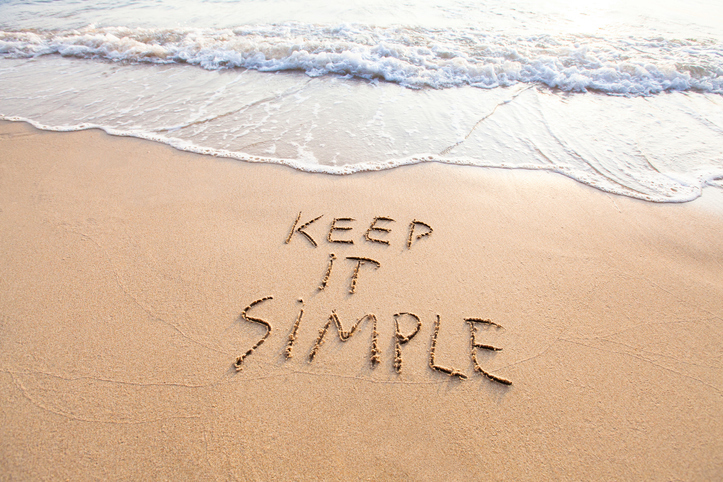 Simplification can’t be generic information that no one gets. This requires balance. When describing your product, make sure that you use terminology and concepts understood by the intended audience. BTW, this is really hard. Focus on the outcomes or benefits that the buyer will get but help them understand how those benefits will be achieved. A list of benefits without understanding of how those benefits are derived is simply unsubstantiated claims. Don’t try to describe everything you do. While you are proud of all your features and functions, most are irrelevant to a buyer. Over explaining turns them off and may cause them to think that they will never use all of this therefore, your product isn’t right for them. What are your main message points? What objections will the listener have and can you do a preemptive strike on them? Why are you different and is that defensible? Simplifying complexity is not easy. We all want to show how smart we are and we all end up trying to sound like standard marketing literature. This is all wrong. Speak and write in natural conversational language. And, as the old adage says: “Say what you mean and mean what you say.” But say it so that your intended audience understands it…or you have wasted a valuable opportunity.